To have a pleasant trip or holiday, you have to make slightly more arrangements than someone else if you have Parkinson’s disease. Still, it is worthwhile. Hans wants to walk himself as often as possible, but also needs a real wheelchair. 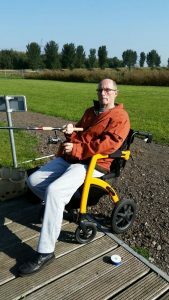 After thirty years of Parkinson’s disease he bought a Rollz Motion at the Fifty-Plus Fair, a walker and wheelchair in one. Sometimes he walks an hour and a half straight like that, with brief intermediate moments of sitting down. Someone always accompanies him to help if his blood pressure drops and he needs to sit down. His wife Paula is relaxed about it: ‘I’m used to it. It’s alright after that. No, I do not stay at home, I do the things that need to be done’. Sometimes this is an adapted bungalow, but it need not be. As long as it is spacious he can find his way with the walker. From Raalte they made trips. ‘In Zwolle you can park in the city centre with your parking card.’ Next week, they are going to the Landgoed ’t Loo holiday village on the Veluwemeer, with their son, daughter-in-law and three grandchildren. The Rollz Motion is coming with them, as it can be folded easily. This way, Hans can take rests in between when he is tired. And next year? Paula: ‘Then we will rent a bungalow on the campsite where my sister is staying. She said: Join us! So much is possible. Hans only needs some manoeuvring space’. What type of walker is that? On their way, Hans and his wife are regularly approached. Paula: ‘People ask: What is that, we’ve never seen something like that before! I give a demonstration then. The bright colours also attract attention. And that it is so lightweight and easy to fold: easy peasy! Apart from the footrests, a foldable umbrella and rain cape also fit into the rollator bag. ‘We always take those with us’. In Dublin they asked the hotel for a room that is adapted to wheelchair users: ‘you can arrange all of that in advance’. Hans sends us a photo of one of his outings – with a fishing rod this time. How does that work, fishing from a Rollz Motion, can he get close enough to the water? Travel with people who understand your situation and whom you can rely on. Choose accommodation that is suited for a rollator/wheelchair. When traveling by air, indicate that you will take your rollator/wheelchair and that you have Parkinson’s Disease when booking. Discuss what help you need at Customs and to get to the gate. Are you travelling by car? Take active breaks that allow you to walk a stretch. Choose what you want to do most and rest the following day – this way you experience your holidays more consciously. Don’t do things that require too much effort: enjoying and relaxing is the most important thing. During an off-day you let yourself be pushed; on a good day you can walk yourself to buy an ice cream or go to that nice pub just around the corner.